I took a picture of this very point in a snowstorm about six weeks ago - it's very photogenic! The deer was helpful - it posed quietly til I'd gotten my shot. Even the animals support SDP! Love it, has the very feel of the woods. I like your photograph. I have a 6 foot high fence. Though deer can jump it, none have in the past 44 years. Before it was up we had them wandering through. I would take the fence down but can't tolerate the nosey neighbors. Love this photo. Lots of wildlife would like it too. one thing we don't have here in the desert is the woods! so, I love this picture, you are lucky it is so close to you! Oh what a lovely photo. Glad the deer posed so well for you. 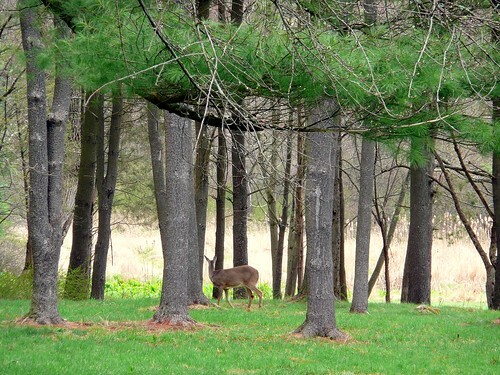 I believe this deer was stopping in the woods on a beautiful spring day to watch the grass turn greener! The green makes for a wonderful contrast. Great shot! What a cooperative deer!